Having departed he came to an end though his flame did not end. On the thirteenth Martinian stripped off his body. 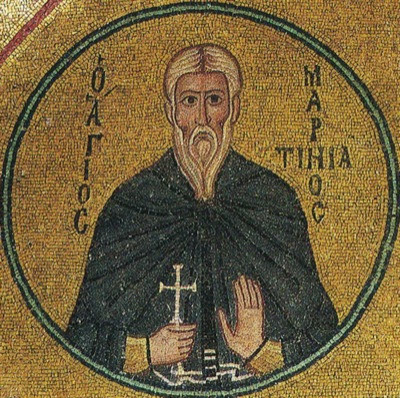 Saint Martinian was from Caesarea in Palestine, and lived during the reign of Theodosius the Younger (408-450). When he arrived at eighteen years of age, he began his ascetic life, and could be found in deserted places and mountains. Having spent twenty-five years in withdrawal and quietude, then, after being tried through various other temptations, he was also tried with the following by the wicked devil. A certain harlot through the actions of the enemy, was moved to wear garments of poverty, and she went to that mountain where the Saint dwelt. When it was evening the defiled one bewailed that she supposedly lost her path, and if she remained outside wild beasts would devour her. Therefore she begged the Saint to receive her into his cell, and not leave her to become food for the beasts. The Saint was unable to ignore her on account of her need, so he received her into the outer section of his cell, while he went into the interior. When it was morning the Saint saw a change in the woman's appearance (for she had with her the wicked apparel of bright colors, with which she would adorn herself at night). Seeing this, he asked her who she was, and for what purpose she came to him. Without shame the harlot retorted: "For you have I come here." Then she began to criticize the lives of Monks and Virgins, and praised marriage. To give assurance to her words, she offered the testimony of the righteous before the Law and under the Law, who had wives, and with such words the shameless one tried to persuade the Saint towards shameful mingling. The Saint assented to his thoughts a little bit, and with his will softened by the words of the woman, he went out of his cell, and considered how to hide and act upon this sin. As he considered these things, he contemplated rather the things of God. Thus before he fell, he understood the fall by God's grace, and was prevented from it in the following manner. Immediately he gathered a number of dry sticks, lit them before the woman, and he entered into the fire, saying to himself: "If, Martinian, you are willing to undergo the fire of gehenna, be persuaded by the words of the woman, and satisfy yourself with shameful pleasure." Having therefore satisfactorily burnt himself, so that he fell to the ground practically unable to move, in this manner he humbled the ferocity of his flesh, and the woman came to such a sensible mind, that she was persuaded to deny the things of the world. He therefore sent her to a monastery and she became a nun. After the Saint was healed of his wounds by the fire, he found a ship owner who guided him to a large rock in the middle of the sea, which was the distance of a day from the shore. There the renowned one lived for ten years, and was fed by the ship owner. Yet even there the good-hating enemy did not leave him untouched. A maiden had shipwrecked at sea, and by means of a plank she came to that rock, and she begged and screamed for him to rescue her from the sea and pull her onto dry land. The Saint out of necessity speedily went and pulled her out, saying to her that grass and fire do not agree with each other. Wherefore he prayed, entered into the sea, and immediately (O the wondrous foreknowledge, that You have for Your servants O Lord!) dolphins came, and took the Saint on their shoulders, bringing him to dry land. 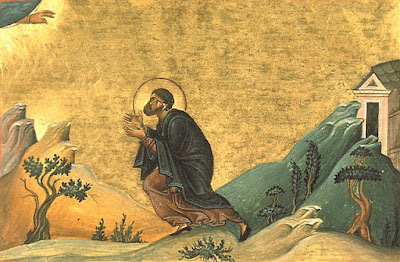 From that time therefore the Saint walked to various cities and lands, saying to himself: "Flee Martinian, lest temptations find you again." And in this way he decided to spend the rest of his life, walking from place to place. He arrived in Athens, and having spent a short time there, he departed to the Lord. He was gloriously buried by the Bishop there, and by a multitude of people, as was fitting. It is said that the woman the Saint sent to the monastery, passed the rest of her life venerably and virtuously, and was counted worthy of performing miracles, and departed to the Lord. * Likewise the other woman, who resided on the rock at sea, dressed herself in the garments of a man, which the ship owner brought her, who had previously fed Saint Martinian, and there she lived fed by the same ship owner. Having passed her life well and loving God, she departed to the Lord. 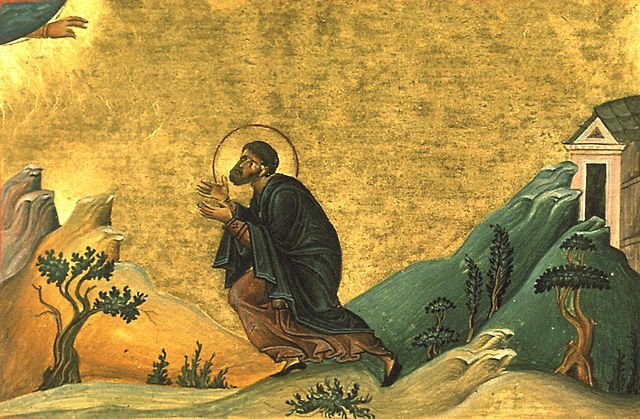 ** The Synaxis of Saint Martinian is celebrated in the revered Temple of the Foremost Peter, which is found attached to the Great Church. * This woman's name has come down to us as Zoe. ** This woman's name has come down to us as Photini.